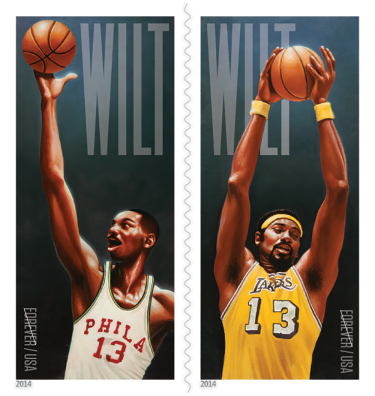 The USPS created a commemorative stamp for basketball star and Hall of Famer Wilt Chamberlain. This is a great collector's item, especially for all of you sports history buffs out there! This year, the U.S. Postal Service® celebrates the life of basketball superstar Wilt Chamberlain (1936–1999). On the court, he was a force of nature. The 7-foot-1-inch center dominated the NBA for more than a decade, setting a plethora of individual records. As a pro, he led his teams to two NBA championships, and in 1962 he scored an NBA record 100 points in a single game. These two Forever® stamps showcase artwork by Kadir Nelson, who created two portraits of Chamberlain. One is based on a photograph of Chamberlain in a Philadelphia Warriors uniform, the other based on an image of Chamberlain in a Los Angeles Lakers uniform. The word “Wilt” is featured in the top right or left corner of each stamp, along with the “Forever” denomination and “USA” in the bottom right or left corner of each stamp. “Wilt Chamberlain (1936–1999)” appears on the left side of the pane. Photographer Ken Regan’s image of a leaping Chamberlain in a Philadelphia 76ers uniform is featured on the right side of the pane. The flip side of the pane features biographical information about Chamberlain.